Red Peony come in a wide variety of shades from luscious scarlet tones and lighter carmines. Either way, they are well known for their deep and intense color as well as their plump and spacious bloom. Peonies come in a variety of shapes and sizes but always maintain a bold quality. Their petals are reminiscent of a soft and fine fabric or paper, one that is so delicate that you'd expect it to crumble upon a single touch. This dainty appearance adds more to their charm, as they look absolutely fabulous in an overflowing arrangement filled by their whimsical character. Choose themfor their vibrant color for an unforgettable bridal arrangement. They also strike quite the chord as decor, spice up a room with a bunch of these and you'll see the difference immediately. 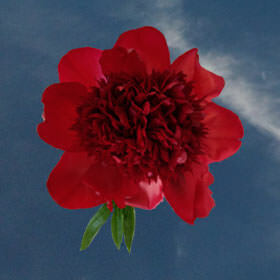 Is there a better way to celebrate the eccentricities and uniqueness of love than Red Peony? Less common than roses, They are an unexpected delight. Their high petal count has earned them a reputation and association with prosperity, success and happiness - especially when applies to marriages and anniversaries. These gorgeous Red Peony will communicate deep feelings of intensity like no other floret, make sure to express yourself like no words can and give them to someone special. The art of growing excellent flowers has been our undertaking. All out products are submitted to a thorough inspection and quality test before being carefully shipped to you. We want you to be able to see and smell the irreplaceable experience of peonies and wouldn't have it any other way.